The group portrait by Albert Herter, in the Academy's Board Room, depicts President Abraham Lincoln signing the charter of the National Academy of Sciences, on March 3rd, 1863. Herter based his painting, made in 1924 for the dedication of the Academy Building, on that historic event. In his apocryphal scene, Senator Henry Wilson, who introduced the bill establishing the Academy, and the group founders look on. 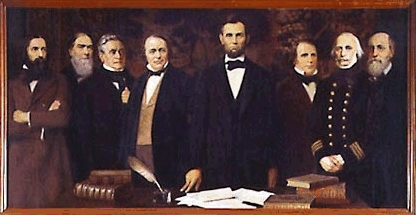 Founding Members (Left to right): Benjamin Peirce, Alexander Dallas Bache (first president of the Academy), Joseph Henry, Louis Agassiz, President Lincoln, Senator Wilson, Admiral Charles Henry Davis, and Benjamin Apthorp Gould.